Can You Figure Out These Logic Puzzles Before You Lose Your Mind? Madge, Muriel and Many were playing poker for fun with matchsticks. During the first round Madge won as much from Muriel as Madge had had originally. In the second hand Muriel won as much from Mandy as Muriel then had left. After the third hand Mandy won from Madge as much as Mandy then had left. At the end of the game they each had 40 matchsticks. How much did each player have at the start of the game? Which number should come next in the following sequence? 1, 9, 1, 4, 1, 9, 1, 8, 1, 9, 3, 9, 1, 9, 4? A coffee maker and coffee cup cost $31 together. If the coffee maker costs $30 more than the coffee cup, what is the price of each? At any gathering there will be at least two people who have exactly the same number of friends present. True or False? A woman has three daughters who in turn each have three daughters. If they're all in the same room, how many pairs of mothers and daughters are there? If four knitters can knit four stitches in four seconds, how many stitches can 12 knitters knit in 12 seconds? When I was 14, my mother was 41. Now she's twice as old as me. If six squirrels can eat six acorns in one-tenth of an hour, how many squirrels would it take to eat 100 acorns in 6,000 seconds? A man was asked about his children. He said, "They're all redheads except for two, all brunettes except for two, and all blonde except for two." How many children did the man have? A six-digit number with 4 at the end becomes four times larger when the four is removed and put at the front. What is the number? You're so logical, you scored higher than Spock on this quiz! You can reason your way out of anything, whether it's a paper bag or high-stakes negotiations with a powerful authority. Your brain is formidable, and your friends, families, and foes all know it. Way to rule the world! 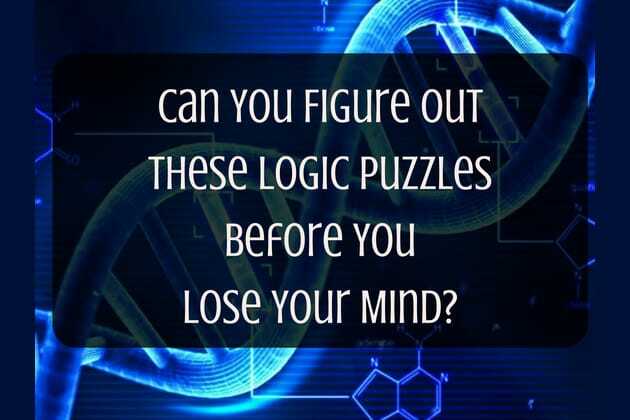 Looks like these logic puzzles drove you to the brink of insanity! Looks like these logic puzzles were making you think so hard, you blew a gasket or five. And that's okay! These puzzles were designed to give your brain the hardest workout of its life. Keep exercising that noggin, and you'll get somewhere soon!